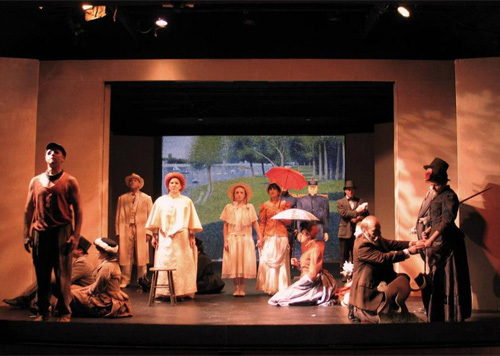 The last production I was fortunate to be a part of was Sunday in the Park with George at Vokes Theater in Wayland, MA (that’s me with the beard in the lower right setting up the monkey). This James Lapine and Stephen Sondheim Pulitzer Prize-winning musical tells a mostly fictional account of the nineteenth century artist Georges Seurat’s time spent sketching for and painting his famous A Sunday Afternoon on the Island of Grande Jatte, his failure to connect with those around him during this process (and during his short life), and his (totally fictional) great-grandson’s resolution of art and relationships 100 years later. In a nutshell. Oh, and I got to sing as a couple of dogs. When I first began to consider drinks I might make inspired by the show, I looked at the mantra Georges repeated throughout the show, his list of attributes that contributed to the creation of his art: order, composition, balance, light, harmony (among others). 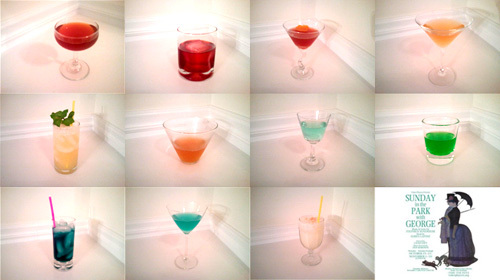 However, these proved too abstract for me (maybe a pousse cafe for order? an equal parts drink for balance?) so instead I turned to the eleven colors Seurat used in his first phase of the painting (there were three phases, I guess, with the second one in which he added the monkey and the third when he painted a pointilistic border around the painting; both phases added to the number of colors used, but I only have so much liquor). There is a line in the show where Georges states, “Eleven colors, no black. Not mixed on the palette, but mixed by the eye.” Lovely. And false, really. Seurat used these colors, yes, but he did mix them freely on the palette before applying them the canvas. 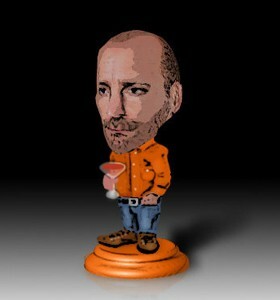 Ah well, artistic license. But I did have eleven distinct colors (or so I thought until I had to make minor blue and yellow variations, but we’ll get to that…). My decision then was to create a set of drinks based on colors, where the spirits and mixers involved did not contribute to any story behind the drink other than the pigment they provided. I thought it was an interesting challenge with a lot of potential for flavor combinations unencumbered by theme (again, until I got to those damn blue drinks…). As I am writing this post after the completion of the full set, I can tantalize you with the image of all together before I break each one down individually.